UPDATE: Joinbox announced on December 17, 2012 that they have decided to discontinue the service (copy of message displayed on homepage). Joinbox is on a mission to create a better web experience for the everyday user. They hope to merge your social activities, email, and news together to form one cohesive consumer website that does it all. This tantalizing video from last year got everyone excited for a one stream solution! One year later, a true product demo has been released along with early access. Did that get you excited? That sure is an elegant, simple, and fluid dashboard. The founding thought of the service is to bring everything to your personal internet mailbox. Do you travel around the world picking up magazines, newspapers, and letters or are they mailed to your home? Joinbox wants to eliminate the need for you to be opening and monitoring numerous tabs and visiting countless websites every day just to stay on top of your networks and the news. It should also be just as easy to check up on your network when you are traveling or on a friend's computer. Five founders started this mission in 2010 after they could not find an easy way to consolidate all the incoming information they were looking at while researching to possibly start a freshly baked croissant delivery service. Since then they said goodbye to the croissant world and hello to Joinbox. It has been a long. hard, and educational journey to build in Node.js and to get to where they are today after starting over from scratch this past summer. This information consumption problem is a complex one and can't be solved overnight. After two months of alpha testing with about a hundred users they are ready for a larger private beta. We have invites! Let's take a look at what Joinbox Double Rainbow can do. Below we see the settings page where everything is setup and deleted. Social Networks - Connect your Facebook and Twitter accounts via OAuth. It will allow more than one Twitter connection, but no Facebook pages. 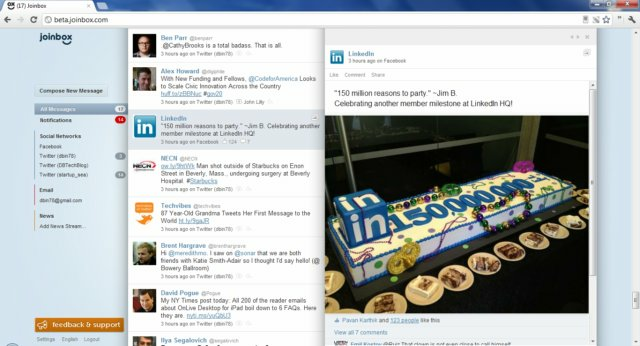 LinkedIn, YouTube, and Flickr integration is in the works. Email - Bring in emails from one or more services by adding your email address and password. News - Search for news and follow sources. Unfortunately this does not support you to directly follow an RSS feed or import a set of subscriptions via OPML. On the main page you are shown the total unread/unseen items with a breakdown for each stream. You may drill down using the left navigation panel to view everything, only social networks, all emails, just news, or individual accounts within each section. When you click on an item in the middle stream it opens to the right. When available, content is included in the displayed item (photos, videos, RSS stories, Twitter conversation, etc). Tweets do not automatically pull in the content from included links. It would be nice for them to do that like Parrotfish can on Twitter. When composing a new message you are able to send it to by email, Twitter, or Facebook. Overall the design is fast and intuitive. If your browser window is smaller it will auto expand the area on mouseover and, as seen above, grey other sections out that are not in use. The only real issue I had was upon login, sometimes I had to refresh to get my feed to come up the first time. Retweeting, replying, favoriting, liking, and commenting all work as expected. I use Gmail and replying broke the "conversation" which I don't like. For a just out of alpha release it is solid and looks very promising. I will certainly be using and testing it, but need to see more features and enhancements before exclusively relying on it. The five founders that make up the Joinbox team are Konrad Mazanowski (CEO), Michael van der Weg (CTO), Felix Steiner (VP of development), Fabian Jordi (development), and Tobias Kneubühler (development). In the future they want to add more services, chat, enhance email functionality, and tackle news aggregation. With that they hope to eliminate double inputs (you don't need to see the same story on three different channels) and to find what is really important to you. They admittedly have a lot of work a head of them. You can follow Joinbox on Twitter, Facebook, and their blog. Who wants to use Joinbox? Retweet the below Tweet, or email me, and tomorrow I will randomly pick ten people from those that did to give access to. Be sure to follow me on Twitter so I can direct message you.